This weekend brings everyone 5th Virtual Round Table Web Conference. You should check it out. There, I’ve discussed #EAPchat during its opening Symposium. 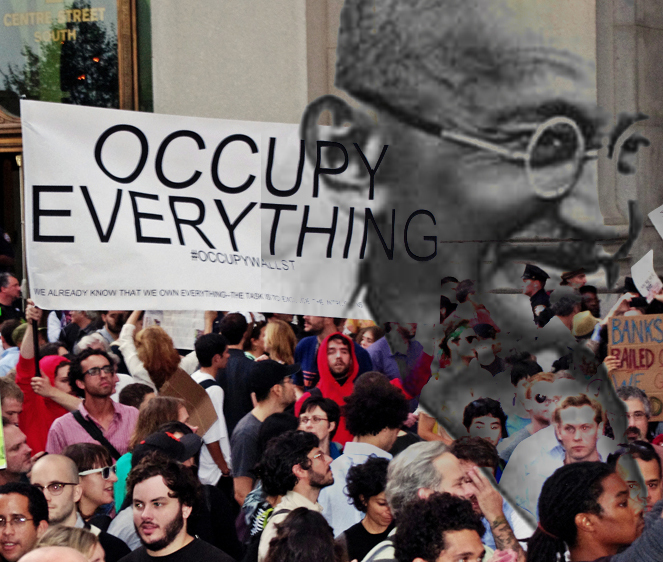 On Sunday, I’ll be talking about using blogs for intensive and extensive reading practice and yep, Ghandi and the Occupy Wall Street movement are part of it. 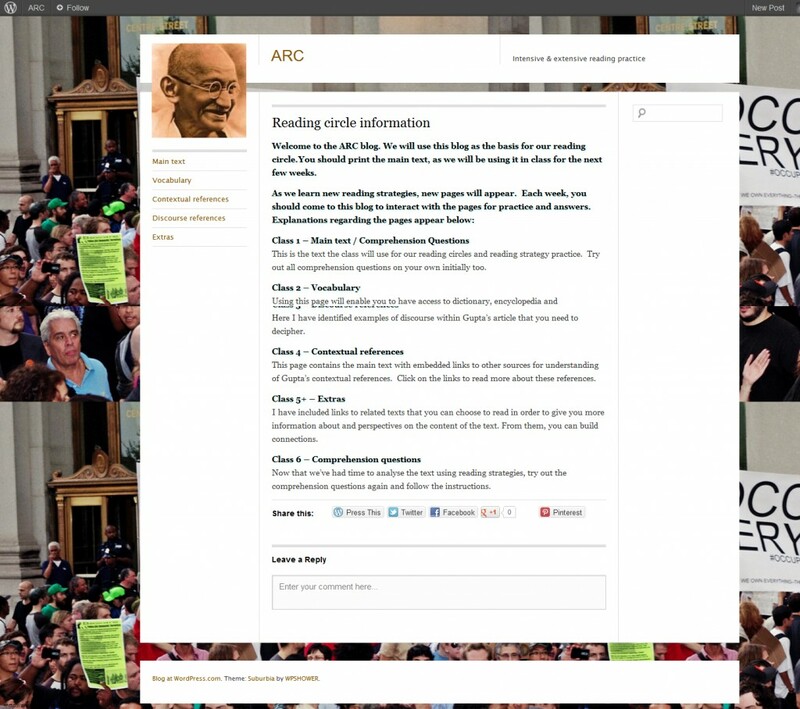 My colleagues and I at University of Toronto, New College, choose texts each week for the academic reading circles usually by copying the text from online articles, reformatting them into a Word document with space for notes. They use this in-class and for homework. We also try to use or make readings available to students on thematically related topics. This was great until a few weeks ago when we thought about switching it up by using the script (and video) from a TED talk on ‘the 99’, a comic based on a group of superheroes representing aspects of the Q’oran. Immediately we thought of putting this one together in blog format. It is here, in case you’re curious. The text is not interactive in any obvious form. You can’t modify or add to existing handouts later without producing more handouts. Providing a variety of extended readings would be photocopy-overload. You cannot have any multimedia in the text. It is challenging to give feedback to all students. There’s a lack of real student involvement and control over the texts. When there is a technological alternative, certain functions can enhance the process and practice of effective and critical reading skills. I’ve set up this exemplar blog to discuss just how to do that here, which I refered to as basis for my #vrtwebcon session on April 22. Click this pic to visit the blog itself. So sorry I can’t make it! Making the most of the technology available makes sense. I haven’t explored the tech aspect but I most certainly have found that visuals have a powerful and positive effect on understanding higher order thinking skills. I’m actually really excited to learn more about this. With online learning I’ve shifted to electronic formats in my reading assignments, but I have yet to tackle the blog. I’m going to try REALLY hard to attend your session live. I teach at 9am so if anything – I’ll catch the tail of it. Looking forward Tyson! 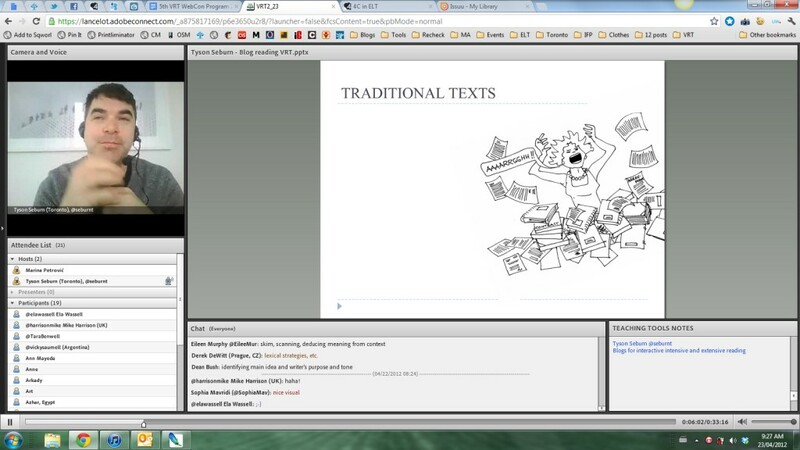 very good presentation to increase reading at different levels! Cheers, Luisa, for the kind words. extensive reading. Keep up the good work.